We’ve been a relatively ‘under the radar’ kind of company so far. We’ve been ruthlessly focused on understanding the needs of the self-employed and developing the products to help them get back to doing more of what they love (not stressing about money). But as we approach our 2nd birthday, we are ready to expand our focus to building up our Tribe. Trezeo was founded in 2016 to help self-employed workers manage their finances. We’ve since evolved to become the only business account that helps self-employed workers look beyond their next pay cheque. Employers do a lot: they pay regular pay cheques, offer paid holidays, pay when you’re sick, and they even help employees save for retirement by paying into a pension. But the self-employed don’t have any of this support. No one makes sure they get paid when business is slow. They don’t get paid when they’re off sick or go on holiday. And retirement, forget about it. So Trezeo is the only business account that addresses income volatility by smoothing customer income across slow and busy periods, helping customers automatically save for holidays and rainy days, and get overall visibility of their self-employed income. We’re proud to have developed a solution and have apps available in the AppStore and GooglePlay, on an invite-only basis (for now). We’re in the final stages of review with the Financial Conduct Authority on our lending license. This approval will allow us to ‘top-up’ customer income to their average when business is slow, and they can pay us back – interest-free – from their future income. Interestingly, the FCA published a consultation paper just last week about the high cost of credit in products like unarranged overdrafts, which is often a last resort for the self-employed who often grapple with the volatility of having an unexpected expense when business is slow. As we are trying to abolish the often unfair and outrageously expensive costs associated with finance (we plan to offer Trezeo for a single, fair, affordable subscription fee), we welcome the review and think it supports our approach. – Pitch 360 Financial Inclusion winner at the Innovate Finance Global Summit. We’re currently inviting independent workers to join our waitlist, and we’re inviting self-employed drivers and riders (a la Uber, Deliveroo, Addison Lee and more) to pilot the app for free. We’re pleased to have people signing up and actually using the app – the feedback has been largely positive so far – and we’re inviting new pilot customers daily to join the #TrezeoTribe of customers. Now that it’s all coming together, the next natural step has been talking to investors. Conversations are going well, and we’ve got some keen angels ready to put their money, and experience, behind us. And the team can’t wait to shout out about what we’re doing and the impact we believe that we can make to the self-employed. Equity crowdfunding is a great way for us to both receive investment and start to spread the word about what we’re doing. It’s a big decision, but it just makes sense for us. We have an experienced team and trusted advisors on board, so we didn’t see the need to focus on taking only institutional investment just yet. It can be really valuable when we’re a bit later-stage and need support scaling, or expanding into a new market. But for now, we think there is more value for us in reaching people who get and love what we’re doing. The self-employed: freelancers, consultants, solo-entrepreneurs, giggers and their families who understand the financial stresses of being their own boss. Not being able to pay bills during slow periods. Not having funds set aside for when you’re sick or something breaks down. And we really like the idea of sharing a piece of us with those who believe in us most when we’re young, yet to be proven, and there’s more to lose. We are looking to raise about £500,000, but what’s even more important to us is that we get hundreds, if not thousands, of people backing us. A #TrezeoTribe of investors. It’s risky, sure, but we are putting ourselves out there publicly because we believe that we’re on to something big and have overcome the biggest hurdles for the self-employed. We’ve got huge aspirations. Trezeo is on a mission to make it more financially viable and exciting to be self-employed. We think the best place to start doing this is to provide financial services and solutions that reduce the uncertainty of income volatility and help customers save automatically for a rainy day or holiday. From there, we want to provide more of the kinds of services that a traditional employer would, but directly to the self-employed, like a pension, life insurance, sick cover and more. We want independent workers to get back to doing what they love, not stressing about money. We believe financial services should be fair and transparent, not intimidating and unfair. And we think fees should be affordable, not crippling. If this resonates with you, personally or professionally, we’d love you to join the #TrezeoTribe. As an investor, you’ll not only hold shares in Trezeo, but we will actively solicit your feedback, welcome your support. 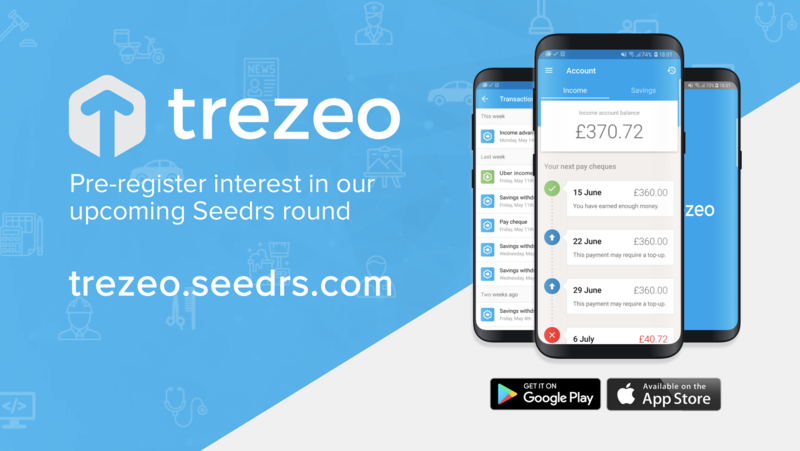 Learn more about Trezeo and get early-access to our Seedrs campaign by registering at trezeo.seedrs.com. And help us spread the word of our campaign with others via social media and email.